This game takes inspiration from early 90's platforming classics such as Rainbow Island, Rick Dangerous and Alex Kidd, which at the time were popular on the Amiga and consoles. 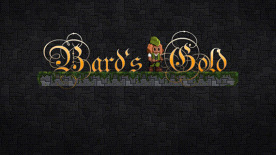 Bard's Gold is slower paced than most current day platformers, but is extemely challenging. Players need to avoid enemies, traps and projectiles in order to progress. Being hit by any of them means instant death. Difficult puzzles and towering bosses will have to be overcome to reach the filthy goblin that stole the family treasure. While I was adventuring, I got my saddle containing the legendary Bard's Gold stolen by a filthy goblin. It has been my Family Treasure for generations... I had to get it back at all costs! Giving chase to the burglar, I went through a portal that sent me to this strange world... I must escape and return the Bard's Gold to where it belongs!